US President Donald Trump has said he is seriously considering funneling detained illegal migrants into the self-declared sanctuary cities that oppose his tough immigration policies. Mr Trump's announcement on Twitter reversed a previous White House assurance that the idea - criticised as political retribution against cities led by opposition Democrats - had been dropped. "Due to the fact that Democrats are unwilling to change our very dangerous immigration laws, we are indeed, as reported, giving strong considerations to placing Illegal Immigrants in Sanctuary Cities," Mr Trump said. "The Radical Left always seems to have an Open Borders, Open Arms policy - so this should make them very happy!" he tweeted. The Washington Post revealed the proposal, which would mark a new flash point in the ever growing political divide over immigration. Mr Trump has staked his presidency on his insistence that the United States is being overrun by migrants and asylum seekers. In comments to reporters later, Mr Trump said that he wanted Congress, where the House of Representatives is controlled by Democrats, to tighten visas and streamline the deportation process. Otherwise, he warned, he will order migrants to be dumped on the sanctuary cities. "If they don't agree we might as well do what they say they want ... We'll bring them to sanctuary city areas and let that particular area take care of it," he said. "We can give them an unlimited supply." Sanctuary cities are places where local authorities - usually Democratic-run - have refused to hand over undocumented immigrants for deportation. San Francisco Mayor London Breed dismissed President Trump's proposal. "This is just another in a long line of scare tactics and half-baked ideas that are just about chasing headlines and distracting people from real issues. In SF we are proud to be a sanctuary city and we'll continue to stand up for all of our residents," she tweeted. "Using human beings - including little children - as pawns in their warped game to perpetuate fear and demonize immigrants is despicable." 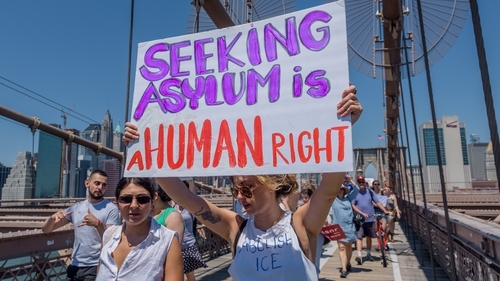 Mr Trump's all-out fight with the Democrats over immigration comes as border agents report being overwhelmed by the number of migrants and people demanding asylum after fleeing violent Central American countries. In a new twist, The New York Times reported yesterday that the president last week told Kevin McAleenan, the soon to be named acting secretary of homeland security, that he still wanted the border closed. According to the Times, President Trump told Mr McAleenan that if he had any legal difficulties as a result of this, he would give him a presidential pardon. As a result of US pressure, Mexico has stepped up detentions of would-be migrants on its southern border, long before they can get near the United States. Mexican authorities said yesterday that a new group, known as a caravan, of 2,500 people had arrived and 350 people had forced their way across the border.